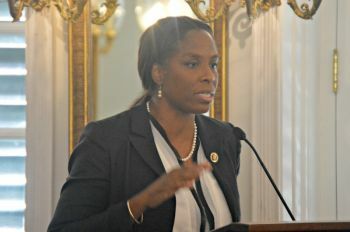 FREDERIKSTED, St Croix, USVI — US Virgin Islands’ (USVI) Delegate to Congress Stacey E. Plaskett joined with House Democrats on Capital Hill in Washington, D.C. on June 22, 2016 on the floor of the House chamber to demand that the Republican majority hold a vote on a gun-control measure before a weeklong recess for Independence Day. Led by known Democratic leaders, including John R. Lewis, the Democrats yelled “No bill, no break!” They effectively halted any legislative activity, and continued chanting even as Republicans gaveled, demanding that the Democrats act in an orderly manner. Congress has long been deadlocked over tightening the nation’s gun laws. But outrage and frustration have grown since the massacre in Orlando on June 12 and a number of other mass shootings in recent years. Ms Plaskett took a break from the sit-in to speak with CBS about the action, aligning with her Democratic colleagues in calling for sensible gun laws in an effort to curb what some consider to be an epidemic of gun-related deaths in the US. “I think that what we’re really trying to say is that we’ve heard from our constituents. We know that the Republican constituents as well have spoken. But there needs to be discussions, [and] more than just a moment of silence. There has been zero debate on gun violence in America, and it is time now to take a vote on legislation which has been in Congress for some time, and is languishing,” Ms. Plaskett said. The delegate says while the Speaker of the House, Paul D. Ryan, has promised to bring bills to the floor, “this has been one area where they’ve been absolutely inadequate. We’ve had too many moments of silence, but we have not had any moments of action,” Ms. Plaskett said. Ms. Plaskett listed a number of laws aimed at curbing gun violence, including bipartisan efforts, that House Democrats are asking the Republican leadership to give an up or down vote. “Whether the House votes yay or nay is to be seen on any of these these bills, but the fact that they won’t even bring them to the floor is abhorrent,” the freshman congresswoman said. She said Democrats have concluded that unless a vote is allowed, they would not go on break. Ms. Plaskett then mentioned the series of gun deaths that have plagued the U.S. mainland, and later brought to the fore the gun violence affecting the U.S. Virgin Islands. She said that per capita, gun violence in the territory is almost doubled what it is in Chicago, a stark comparison that brings into focus the major problem facing the U.S.V.I. Delegate Plaskett is being challenged this year by former Senator Ronald Russell. she likes to be in thing she have not seen yet they not studying the USVI? girl go siddung or come to tortola for a companion.